Dog Friendly Restaurants in Austin: Patios with a Welcome Sign for Dogs! Looking for dog friendly restaurants in Austin? Austin has gone to the dogs! You can bring your dog almost anywhere in the ATX. Culturemap has found the most dog friendly restaurants in Austin. ABGB is not only one of the most dog friendly restaurants in Austin, they give back to dog rescues! ABGB gives $1 from each APA! APA American Pale Ale to Austin Pets Alive. ABGB also hosts adoption events and fundraisers often. The menu features delicious pizzas, small plates, salads, and sandwiches. They use local ingredients and even have gluten free options. It's Mega Mutt Monday today folks, and it's gonna be a good one. Great dog vendors, live music by 3 Chord Rodeo, and happy hour all day! But it's a NEW and IMPROVED happy hour! Select $3 apps, $5 sausages, and $4 and $5 beer and wine specials! And in case that wasn't enough, we're also tapping the incredibly limited @bellsbrewery Hopslam Ale today at 5pm! Located on Rainey Street, Banger’s has a fenced-in dog run, water bowls, and a menu for dogs! Don’t worry, there’s plenty to entice humans as well. Banger’s huge beer selection, house-made sausage, and abundance of shade is great for everyone. Cementing their status as a dog friendly restaurant in Austin, Banger’s also has Mega Mutt Mondays and regular pet charity fundraisers. Contigo is a dog friendly restaurant in Austin near Mueller. They have a huge patio that’s perfect for your pup! Contigo’s beer and wine selection is extensive and goes great with their tasty South Texas ranch-inspired food. Let your dog play in their gigantic outdoor area under the trees while you enjoy their Southern Comfort Food menu and a beer, glass of wine, or cocktail. This place is the epitome of South Austin cool. Located just south of downtown, Vinaigrette serves salads that are to die for. They have a large outdoor patio with lots of water bowls for your pup! 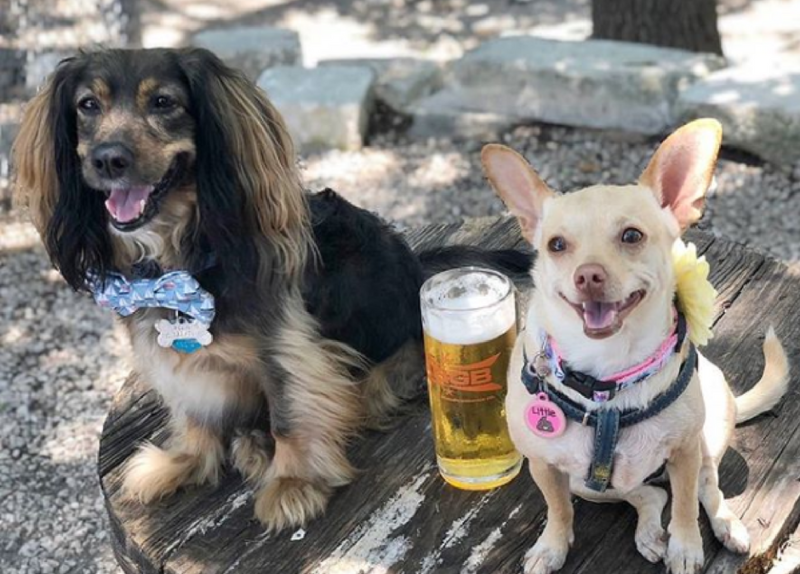 This dog friendly restaurant in Austin also has happy hour 2:30 to 4pm Monday through Friday! Want to move closer to dog friendly restaurants in Austin? Take advantage of our apartment locator services that are experts at renting with pets, or call or text us at 512-258-0078!